For this first failed weapon we go back to the First World War and the first aircraft to bear the Supermarine name. The company changed had it's name from Pemberton Billing in 1916 (after Mr Pemberton Billing sold his interests to the company's other directors). One of the last aircraft Pemberton Billing had been working on had been the PB 29E, a large quadruplane for anti-airship defence. 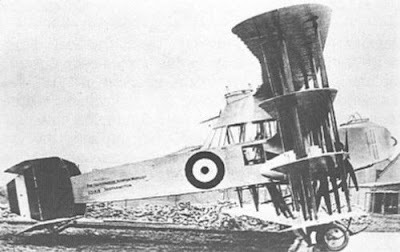 Unfortunately the sole PB 29E crashed during flight testing but the Admiralty decided to continue pursuing Pemberton Billing's ideas for combating the zeppelin menace so sponsored a further aircraft. This was the PB 31E, like the 29E it was a large quadruplane 37ft (11.27m) long and with a wing span of 60ft (18.28m). It was made more sturdy than the 29E with a planned crew of 5 and heavily armed with a 1½-pdr recoiless gun and twin Lewis machine guns. It was intended to be able to stay aloft for up to 18 hours and carried a searchlight that was powered by a separate engine and thus was probably one of the first aircraft to carry an auxiliary power unit. Because of the long planned duration it was fitted with some basic comforts for the crew including a heated cabin. The aircraft also carried armour in some key areas and the cockpit was bound with fabric to avoid wood splinters in the event of a crash to protect the crew. The problem with all of these innovative and advanced features was that they weighted a lot! The PB 31E weighed over 6100lb (2787kg) when loaded and there simply wasn't the engine technology at the time to adequately power such a plane. 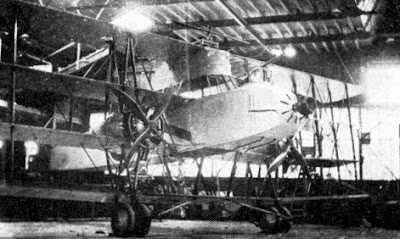 Two 100hp Anzani engines powered the PB 31E and was enough to get it airborne but not enough to give it sufficient performance to perform in the anti-zeppelin role. The PB 31E took an hour to climb to 10,000ft which meant that zeppelins could easily escape it by ditching ballast and climbing rapidly. The design speed had been 75mph (120kph) which was considered fast enough to catch zeppelins (though some zeppelins could go faster than that in favourable conditions) but it is reported the PB 31E struggled to pass 60mph (97kph). The PB 31E first flew in February 1917 but by then it was apparent there were flaws in the concept, highlighted by the PB 31E's poor performance. Unable to pursue a zeppelin it's only chance of success would have been the sheer luck of being in the right place at the right time and firing on the zeppelin before it got out of range. It's main armament, a 1½ pounder Davis non-recoil gun, was also rather unwieldy. How do you turn music into money?